This is a continuation of the Previously Approved “Proposal for SmartCash expansion within Mexico with Social Media and videos” Hello Smarties, After creating a Pre-Proposal and hearing the comments from the Community, I am Presenting this Proposal before you with the changes suggested in Discord. I am @thewalk_er my name is Ignacio Figueroa and I live in Mexico, I have been working in the community for 6 months now, helping to spread the word about SmartCash in Spanish. For the last four months I have been producing informative videos, tutorials and interviews on several events in the Youtube Channel “SmartVlog” https://www.youtube.com/channel/UC6any6NuctZ3R7roopbARwA/videos21, And working as well with the help of @oucan with the social media channels and creating the community in Mexico. The previous Proposal ends on March 31st. And in order to continue the efforts I am submitting this new Proposal upgraded from the previous one with more content and services and which I have called the version 2.0 This can start with your help on April through July. We have a population of 650 Million people living in all Latin America, most of them are new to this new technology, the blockchain. We are an emergent continent with a lot of potential in tech-industry and leading new fintech endeavors and blockchain initiatives, who are waiting to discover new ways of decentralization and economic freedom. Spanish is the Second most used language in the world only after Mandarin by native speakers and communicating about SmartCash to all these population is a challenge, that is why I have decided to continue this effort, now with the expansion to Latin America countries, which for so many reasons are far away from knowing what the blockchain is and what SmarCash is, now it is time to achieve new goals and break the borders to reach even more people. • This time I am increasing the quality of the videos and adding a cinematic production. • 90% of all the income from the previous proposal went directly on buying new equipment such as Professional Video Cameras, Audio Systems, wireless microphones, recorders, Lighting, Livestreaming Equipment, and Hardware for Post Production. Since I own a Photography Service Company I also have an array of lenses, reflectors, flashes, backgrounds, tripods, stands and all type of gear needed. • In the previous proposal it was agreed to create at least 4 videos per month, in this proposal I am increasing to 6 videos per month minimum. So I am increasing the number of videos for the same previously budget approved. 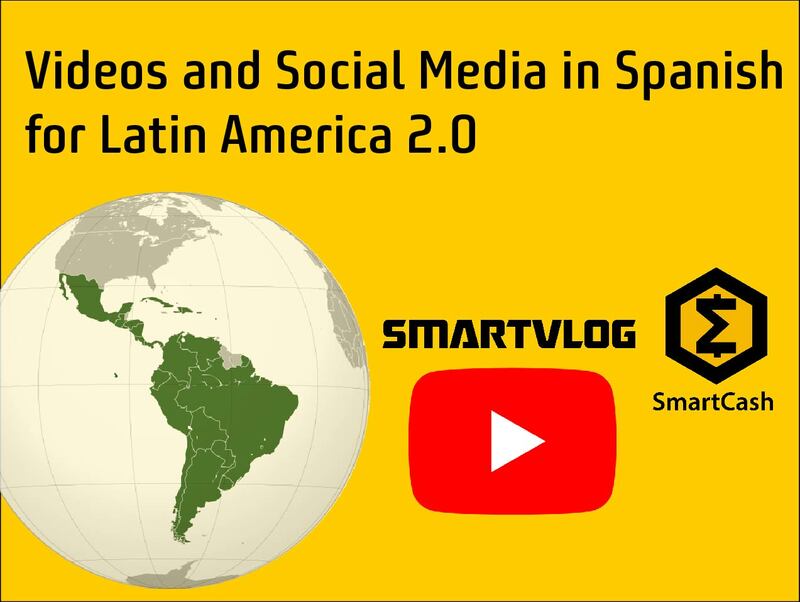 • To visit at least 4 Latin American Countries where events about SmartCash are hold, record the events, make the interviews and make livestreaming on social media. • To assist to every event in Mexico related with SmartCash to record and create the content for promotion. • To keep managing the Mexico Group for Facebook with a total of 1,676 community members. • To keep Managing the Twitter account for Mexico and the WhatsApp group. • Managing the community is a challenge since this has to be done in a very respectful way and giving a follow up on all the questions that might rise. -A constant follow up on this social media is key for bringing more users to the platform. At the end of the project, a compile of experiences and documents will be created for future initiatives in other regions. • 115 hours per month on pre-production, traveling, production and post-production. If the community believes that the proposal length can be increased from 4 to 6 months I can keep the same monthly budget. Adding Argentina and Chile. Please note, that with the same amount approved previously I am adding four international trips and two more videos per month (6 videos per month). So no increase in the budget but offering more results, and a very competitive budget, this is the way to maintain the trust in the community by giving more and contributing to this project. Payments are due at the end of every month after deliverying the report. Videos are uploaded as soon as are edited. Social Media Management its run 7 days a week. By voting YES on this proposal you are giving the opportunity to many to know about our project in Latin America.